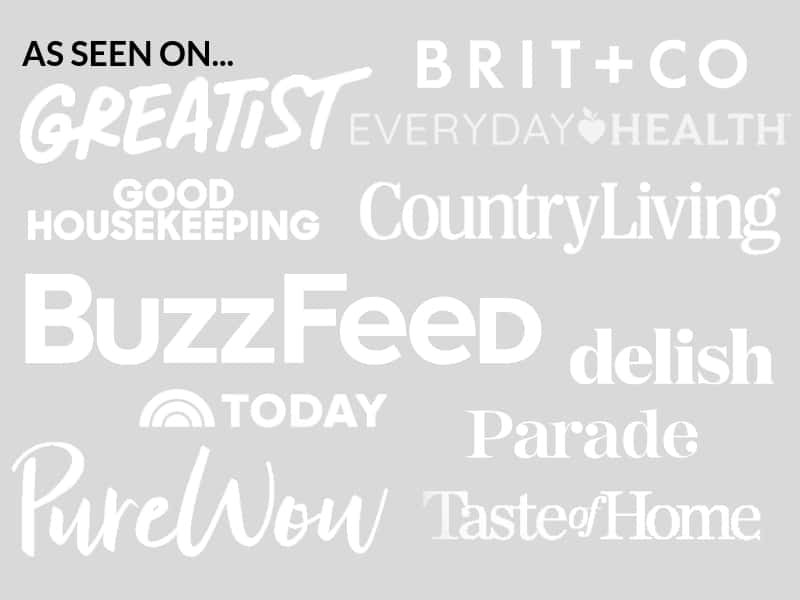 February 26, 2015 By Elizabeth Lindemann 10 Comments / This post may contain affiliate links. Looking for a fun, flavorful meal that will make you completely forget about the barren, cold, winter wasteland that surrounds us? (well, at least those of us in the Boston area.) I have the perfect fix. Tacos! And not just any tacos. 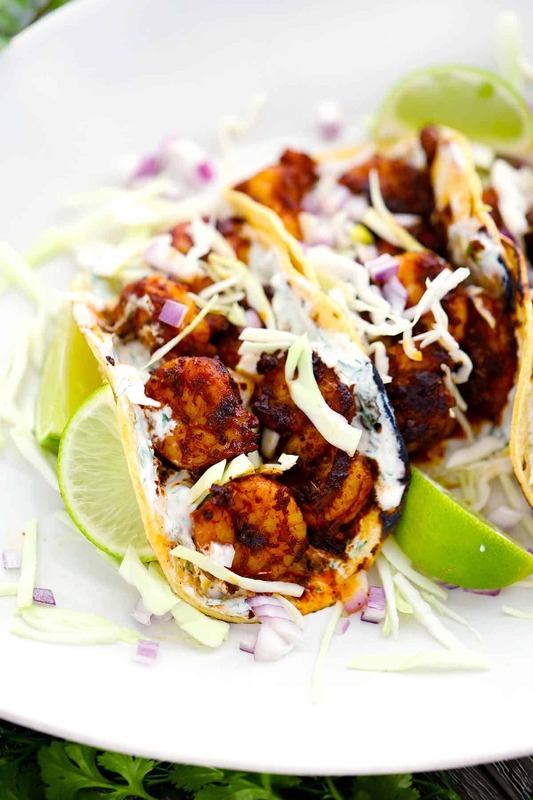 Blackened shrimp tacos with creamy dill sauce. These tacos are, simply put, the bomb-dot-com. They are healthy (especially since the base of the sauce is Greek yogurt). They take only 20 minutes to make (!!). They are simple, light, satisfying, and extremely delicious. And you must make them ASAP. In summary, blackened fish/shrimp/etc. is DELICIOUS and you MUST try it. If you want to save time on this, mix the blackening spices together in bulk ahead of time, or buy a pre-made blackening spice mixture. Don’t be put off by the long list of ingredients here, since most of it you will likely already have in your pantry. Healthy, fast, easy, light, and SO yummy. 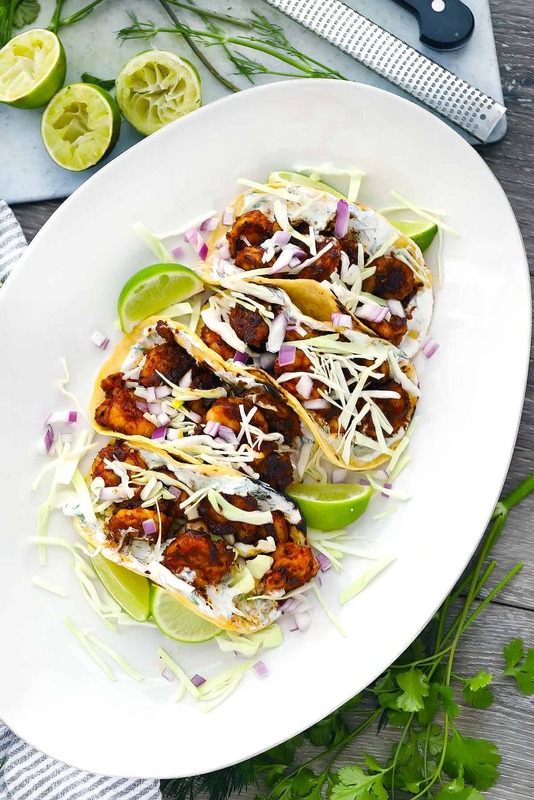 These blackened shrimp tacos will have you thinking you are on a sunny, warm beach in no time! Mix the ingredients for the blackening seasoning together and set aside (alternatively, you may use 3 tablespoons of a pre made blackening seasoning). Mix ingredients for creamy dill sauce in a bowl. Refrigerate. Pat the shrimp as dry as you can. Coat shrimp in olive oil. Press the shrimp into the seasoning mixture to cover all sides. Heat butter in a cast iron (or other heavy) skillet. Cook shrimp in butter on medium-high heat on both sides until cooked (approximately 3 minutes on each side). Serve tacos by layering 2-3 shrimp in each tortilla, topped with creamy dill sauce and other optional fixings. Yummy! I like your decision to use dill in the sauce. Also, I’m with Lynn and her margarita idea! Thanks, Rachel! I put dill in just about everything. Love it. 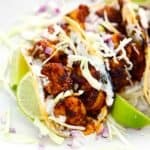 Love me some shrimp tacos and I can’t wait to try yours. Especially with that creamy dill sauce. YUM!!! I’ll take two of these and a margarita on the rocks. Thank you. That is all. This sounds really really good and I love your write up!